Monique Billings tied a school record against WSU with 25 rebounds in a game. Photo by Zyaire Porter/T.G.Sportstv1. 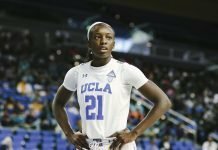 Los Angeles, Calif. – The depth of the No. 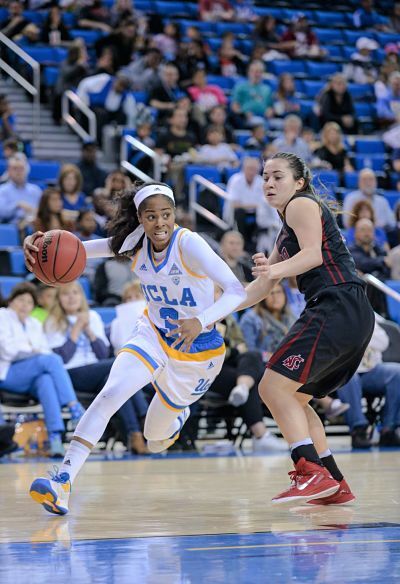 18 UCLA Bruins was on display Sunday as they easily handled Washington State, 67-48. 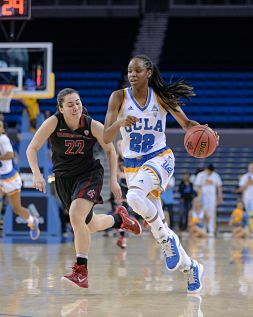 Kennedy Burke led four UCLA players in double figures with 17 points in the team’s last regular-season game at Pauley Pavilion. But it was forward Monique Billings who had the performance of the day, with a program-tying single-game record 25 rebounds, as well as 12 points. The hosts outscored Washington State in every period, and led by as many as 26 points in the fourth quarter. 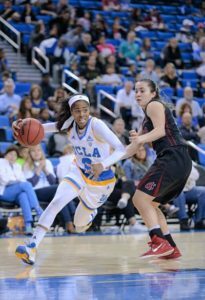 It was a balanced effort by the Bruins, who have relied heavily on mercuric guard Jordin Canada. But a neck injury kept Canada out of the starting lineup for Friday’s game against Washington, and a bout with food poisoning limited her minutes and production against the Cougars. 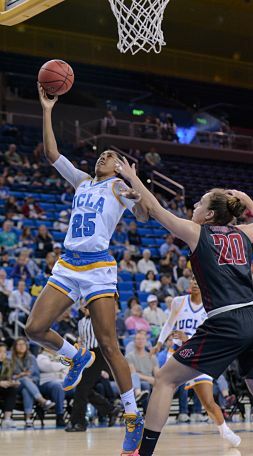 Jordin Canada came off injury and illnesses to put up seven points, dish seven assists and generate a lot of energy for the Bruins. Photo by Zyaire Porter/T.G.Sportstv1. UCLA coach Cori Close said she was pleased with the way her team stepped up in Canada’s absence. 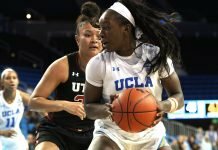 Kennedy Burke stepped up to score 17 points for the Bruins. Photo by Zyaire Porter/T.G.Sportstv1. The Bruins have been ranked all season long, but have stumbled at times on the road. After a long team meeting last weekend, they have come together and picked up the pace, and knocked off the No. 9 Washington Huskies Friday. 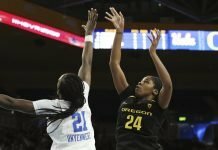 Close said UCLA plans to stick together through their final two regular-season games before the Pac 12 Tournament. We interrupt this preview for a great piece…….